As a kid, I loved Valentine’s Day parties at school. About an hour before school let out, we’d all go around the room, stuffing cardboard mailboxes or paper bags with specially selected paper valentines. I remember going to the store with my mom and agonizing over what style valentine cards I should get. Those with pictures of Matchbox cars usually won out. I’d hold on to my little school year valentines well until summer; they made a little grade school boy feel special the rest of the year. So, I started thinking…why should kids have all the fun? 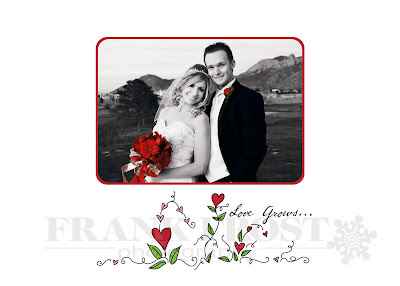 New this year are Frank Frost Photography Grown-Up Valentines!! Our Grown Up Valentine Cards are 3 1/2 x 2 1/2 and come with your choice of image from a previous session, name and greeting. (We’ve watermarked the samples on the blog; the finished cards will be free of any markings) If you need a session, we can take care of that, too! A set of 25 are only $39.95, which means you can pass out Valentines to your co-workers, your family, your school friends…anyone you’d like to make feel special the rest of the year. 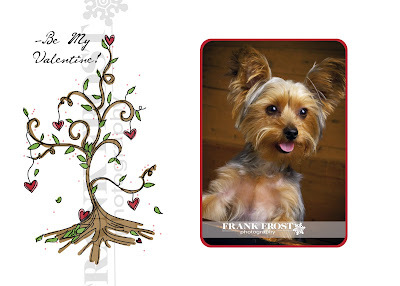 Imagine arriving at work to find a personalized Valentine sitting on your desk! And because of their size, they can easily fit into any standard wallet. Pretty cool stuff! !